I want to take this opportunity to congratulate everyone graduating from various academic institutions this month. Despite the economic challenges we all face, I continue to believe that education is vital, so I pray that the pursuit of degrees will be a goal that many pursue. I thought I would share two photos from 2001, the year I received my Master of Divinity (M.Div) from St. Bernard's School of Theology and Ministry. It was my second degree from St. Bernard's; I received an M.A. in Theology in 1998. 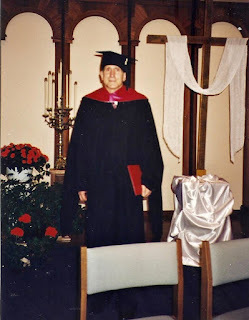 In addition to receiving my M.Div in 2001, I was also greatly honored to receive a special academic achievement award. As I looked back at 2001, the trustees of St. Bernard's probably could not have imagined that I would have used my education to challenge some of the long-time policies of the Roman Catholic Church. However, I do hope, in restrospect, that they can at least appreciate the fact that any arguments I present to the church's hierarchy are aided by the excellent education I received. Whenever I challenge a long-standing policy, I try to articulate my arguments with good theology, history and practical applications. It is important to state the Bishop Matthew Clark is the chancellor of St. Bernard's. I truly appreciate that he has been kind and tolerant during my crusade to change some of the long-standing policies of the church. I will miss him following his retirement this year. The second photo above recalls a humorous moment from my 2001 graduation. The hands in back of me are those of Bishop Clark. He had a hard time fitting me with a hood, for he didn't anticipate my height. In retrospect, he probably would have fitted me with a muzzle over my mouth, if he knew how much trouble I was going to cause for the hierarchy following graduation. My congratulations to all who are graduating this month! I continue to monitor the tense situation that exists between U.S. nuns and Vatican officials. I must admit that I am mystified as to why the Roman Catholic hierarchy chose to target women of faith who have dedicated their lives to the well-being of others. In comparison to bishops and priests, nuns have been guilty of very few crimes against humanity. Therefore, especially in light of the continuing sexual abuse scandal, it is an outrage that the Vatican has chosen to target nuns for harsh treatment that goes beyond reason. Our good sisters have served the Catholic Church well for many centuries. They continue to serve in such varied disciplines as education, social justice, medicine, parish leadership and assorted ministries that are too numerous to mention. In the photo above, I am demonstrating my solidarity with U.S. nuns. There will be prayer vigils scheduled throughout the United States during the month of May. The vigils will be designed as a prayerful means for Catholics to show their support and appreciation for all that our nuns do for us. It is my prayer that the Vatican will show appreciation for our sisters, as opposed to persecuting them. For the past several years, I have articulated my assorted views on church reform at this blog. Despite the fact that some of my views have been in sharp contrast to those of the Roman Catholic hierarchy, I appreciate the fact that Rochester's Bishop Matthew Clark has never tried to discipline me. I have always considered him to be fair-minded, whereby he has consistently tried to strike a balance between conservative and liberal voices within the Rochester Diocese. 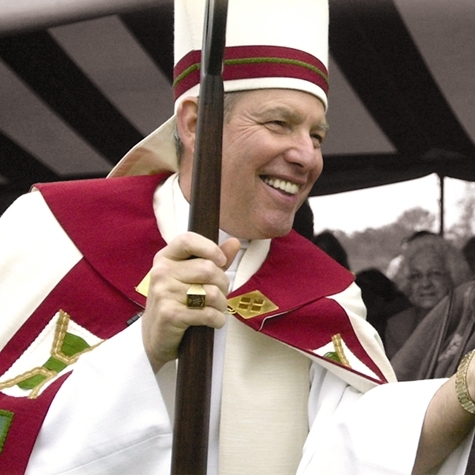 Bishop Clark will turn 75-years-old on July 15 of this year. This means that he will be required to submit a letter of resignation to the Vatican on or around his birthday. Considering that he has led the Rochester Diocese for 33 years, the thought of a new bishop will be unsettling to many. If the Rochester Diocese follows proper protocol, local priests will be allowed to submit the names of three qualified persons they feel could be Matthew Clark's successor. My guess is that Fr. Kevin McKenna would be at the top of such a list, considering that he is pastor of Sacred Heart Cathedral and was a former president of the Canon Law Society of America. I studied Canon Law with Kevin as part of my graduate theological studies, and I found him to be fair-minded, much in the same way I find Bishop Clark. If a list of three persons is submitted to the Vatican, the powers-that-be will either choose one of the names, or ignore the list completely. The pope could ultimately decide to send what amounts to an enforcer-bishop to Rochester, which might please conservatives, but would also serve to alienate mainstream Catholics. If you have been following my blog on a regular basis, you are aware that my status as a Roman Catholic is in limbo. When I was ordained a married priest in 2006 by a married archbishop, a Vatican official termed my ordination as valid, but illicit, which means from a canonical standpoint, my status as a priest is valid, but my ability to serve in a diocesan capacity would be illicit (celibacy is required). Some canon lawyers argued that I excommunicated myself via my ordination. Whatever the case may be, I appreciate the fact that Bishop Clark never reprimanded me for my ordination, which has aided my ability to function as a married priest locally, independent of the institutional church. I want to take this opportunity to thank Bishop Matthew Clark for his many years of service to the Rochester Diocese. His shoes will be difficult to fill.